Buoy Lift II | THERMO Spoken Here! The sketch, (1), shows a buoy floating in the sea. A cable lowered from a dock is attached to the buoy and the buoy is hauled to state (2). Take the system to be the buoy, a short length of the cable and part of the sea. Calculate the least work of the cable. In beginning thermodynamics heat, (ΣQ) is the easiest term of the energy equation to address. Upon initiation of the event (at t = 0-), the sum of heats to the buoy and sea (ΣQ) equal zero because the buoy and sea are in thermal equilibrium with the atmosphere. There is no expectation that this "lifting" event will cause any significant temperature change anywhere and hence create no motive for heat. The approximation that Σ Q ≈ 0, is a reasonable simplification of this problem. Now specify the kinetic and potential energy changes and insert the numerical information from the schematic. 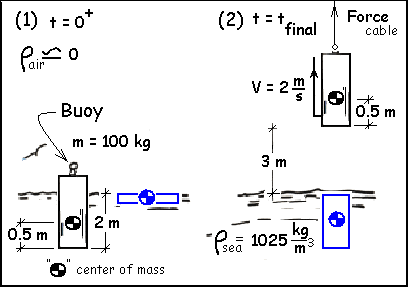 This problem was worked before as BUOY LIFT I. From this current vantage only one work component, work of the cable, is relevant. Why is this work not the actual number but the LEAST possible work. ♦ With the event, there will be splashing and swirling of the water. The event imparts energy to the water and that energy dissipates into the surrounding water. Our calculation ignored that face - the number for work calculated in a minimum value.